Home / Events / What to do with those punch cards? What to do with those punch cards? 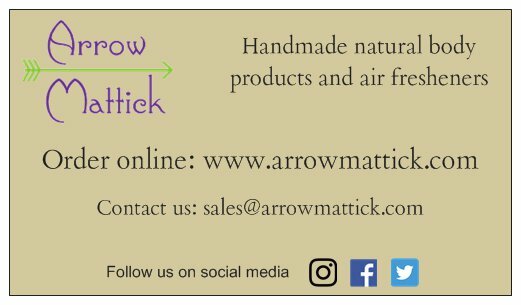 Every year we hand out or send out thousands if not 10’s of thousands of punch cards at our festivals and with all of our online orders, but we only get a small fraction of those cards back from people who want to collect their free soap, soap bag or soap dish (just one, not all three). Occasionally people we ask us how to redeem them online. This post is meant to explain it. If you have two punch cards that each have 3 punches on them (6 total) and you are going to purchase 4 or more full priced items ($5 or more) you are eligible for a free soap, soap bag or soap dish. Simply write VOID with a pen or marker across those two cards and take a picture of them. Send an email to arrowmattick@gmail.com with the picture of the voided cards and let us know what you would like for your free item. Its that simple. What if you order 10 or more full priced items ($5 or more) and you want to include your free soap, soap bag or soap dish? Even easier, just include what you would like in the notes section and we will get it for you when we send out your order. What if I order 10 or more full priced items ($5 or more) and I don’t tell you what I want? Usually we will either email you or we will guess what you want (usually what you ordered the most of) and we will include it with your order. What if I have cards with 10+ punches on them, can I just redeem it online and have you send it to me without a purchase? Unfortunately due to the cost of shipping we only will add them on to existing online orders, but check our events calender and see when we will be close to you and stop by. We will be more than happy to give you your free item at a show without a purchase.